Abu Dhabi, UAE – 27 November 2018: The 47th UAE National Day celebrations at Abu Dhabi’s favourite Mall, Dalma Mall will feature the region’s most popular attraction and funniest animation series, “Shaabiat Al Cartoon” in cultural splendour during this national holiday. Kids and families will get to meet and greet the famous Shaabiat Al Cartoon Characters Shambeh, Affari, Atooga, Mhayer and Bu Mhayer and also get a chance to win some SAC goodies, whilst celebrating the national day festivities. 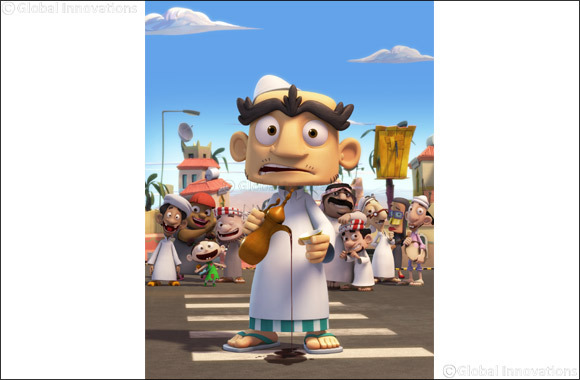 Originally began as a mobile phone animation series in 2004 and quickly turned into one of GCCs funniest animation, “Shaabiat Al Cartoon” is based on a group of Middle Eastern families and individuals living in the United Arab Emirates humorously portraying their lives and traditions in an engaging way. To complete the National Day Festivity, Dalma Mall will feature the live interactive musical show in addition to traditional Emirati performances on the 1st to 3rd of December starting from 5 pm to 10 pm. The mall is also featuring the longest digital light décor on the mall’s façade in addition to UAE flags which will be a unique experience at night that cannot be forsaken. The mall is also hosting the National Day Traffic Safety Exhibition under the theme “Let’s celebrate without Accidents”, from 25th November to 29th November in collaboration with SAAED and the Ministry of Interior. This event aims to greatly highlight all about Traffic Safety procedures to raise awareness about avoiding road accidents for the public. Dalma Mall’s ‘Shopping Spree’ season, that kicked off on the 21st of November, will continue till the 5th of December where residents and tourists can shop more for less from a wide array of brands across diverse categories. Dalma Mall congratulates and extends its warm wishes of great prosperity, unity and peace to the nation and the leaders of the United Arab Emirates on the occasion of the National Day.